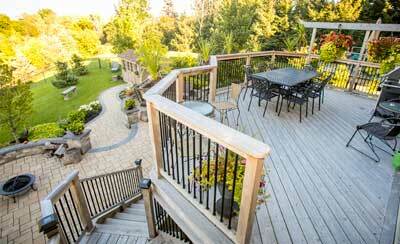 View our portfolio of complete backyard landscaping projects. Backyard landscaping can transform your plain and simple backyard into a welcoming backyard retreat that family and guests are sure to frequent. While many homeowners often choose to do their own landscaping, having a professional landscaper to help with a large or small backyard landscaping project can make all the difference. A professional landscaper can not only help you to design the perfect outdoor space, but they also have access to professional knowledge, tools and skills to create the perfect backyard landscape—and all in a timely and consistent manner, taking the pressure off of the homeowner to get the job done over a weekend. For over 25 years, Hogan Landscaping has been providing consistent and quality service to each and every one of our customers. Our team of in-house experts ensures you’ll get exactly what you want out of your backyard landscaping—with minimal disruption to your lifestyle. Whether you’re looking for a tranquil backyard getaway or a safe place to enjoy with the kids, Hogan Landscaping can help you make your landscaping dreams a reality. Secluded Gardens and Entertainment Area? There are many ways to landscape a backyard that it can easily overwhelm homeowners who try to do most or all of the landscaping work themselves. What makes hiring a professional landscaper a good idea for homeowners is that more often than not, a landscaper’s portfolio can inspire ideas about how they may or may not want their own backyard landscaping project to look. At Hogan Landscaping, we have a vast portfolio filled with images of many of our past projects. We hope that it inspires you to create the backyard landscape of your dreams. To us, landscaping isn’t just about installing your pool, patio or garden. We take pride in creating the ultimate outdoor space that our customers are going to love for decades to come. Whether you want a secluded garden all to yourself or a gorgeous outdoor entertainment area for your family, friends and guests, we are dedicated to providing you with a backyard landscaping paradise everyone is sure to love. Landscaping your backyard isn’t all about the plants. Hardscapes like patio decks, stone retaining walls and brick paver paths all require vast planning, a well-prepared blueprint and a good crew of tradespeople to get the job done without disrupting the homeowner’s property. Features like pergolas, arbors and ponds are often left out of a homeowner’s backyard landscaping plans simply because the job isn’t within their DIY skill range. That’s why here at Hogan Landscaping, we want you to take pride in your outside. No backyard landscaping feature is too big or too small for us to tackle. We warranty all of our stonework for two years as well as all plant material for the entire year. Our attention to detail, consistent work ethic and high standards set us apart from all other landscaping contractors. If you’re ready for the perfect backyard landscaping design from start to finish, give Hogan Landscaping a call today at 416-293-8474 or fill out this form online and take a step closer to the backyard of your dreams.